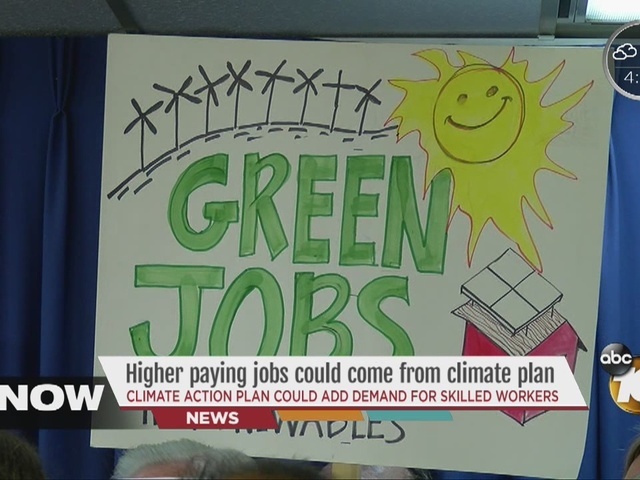 Raises are hard to come by these days, but the city's proposed Climate Action Plan could mean more jobs with better pay, many not requiring a college degree. These days, Joey Giaramito is learning how to install solar panels. He currently interns for Grid Alternatives in Barrio Logan, but said his free labor will soon pay off. ”There really aren't opportunities for people to enter the industry when there's this requirement for experience as an installer,” he said. If San Diego’s proposed Climate Action Plan is ultimately approved, Giaramito may be ahead of the rest. The plan, heard by the city's Environmental Committee today, has an ambitious goal. It aims to cut the city's greenhouse gas emissions in half by 2035, by doing things like installing more energy efficient products like solar panels. “When we increase our renewable energy capacity, when we promote energy efficiency, someone's got to go out there and do that work, and that in turn creates jobs,” said Jason Anderson, president of Cleantech San Diego. The key thing about these jobs is that many don't require a college degree, but pay middle class wages. For instance, a solar energy system installer has a starting salary of about $38,000, and that’s the lower end. Laura Galavis, who retrained for a solar job at Grid Alternatives a year ago, said there still aren't enough workers to fill all the jobs. Training programs are also available through UC San Diego Extension, San Diego State University, and the Community Colleges. The Climate Action Plan says there were more than 340,000 green jobs in San Diego in 2011. Giaramito said his internship is getting him ready for a new one. “You can go from something like that and become an installer within a few months if you go to installs every week,” he said.